Corrugated Plastic Sheets (Coreplast) are lightweight, multipurpose protection for flooring, elevators, glass curtain walls, and decorative concrete. Our standard corrugated sheets are white on both sides and contain some recycled plastic content. Not available for UPS ground shipping. Call for up to date pallet pricing on 275 sheets. PRICING FLUCTUATES WEEKLY AND INCLUDES SHIPPING VIA LTL FREIGHT. CALL US FOR UP TO DATE PRICING INCLUDING DELIVERY Sized 4 ft. x 8 ft. Corrugated Plastic Sheets are a multipurpose product perfect for protecting flooring, elevators, windows, and decorative cement! 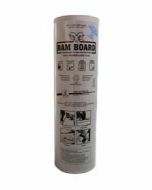 Tired of using heavy plywood or masonite for a sturdy floor protection? 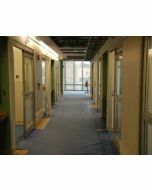 Need a lightweight, waterproof, easy to install flooring or elevator protection? Paired with our 2 inch red, Polyethylene Tape for large areas requiring protection, this protection will save you time and money! We've seen these sheets being used to protect everything from stair landings to door jambs and exterior windows. Work well as a curtain wall protection when taped together. Why use masonite when coroplast sheets can perform the same function and are easier to use? Box stores charge 21.46 each per sheet-buy direct for great savings on this popular product.